MamaInsomnia: I'm visiting a friend today! I'm visiting a friend today! I'm guest posting today over at Work, Wife, Mom, Life, so head on over there! I'm talking fashion and shopping so you don't want to miss it. Since were talking about traveling, I thought I'd make today's Mom Friendly Meal a little exotic. Ok-it only looks that way. Really it's super easy and delicious. I love Chinese food, but it can be expensive and I feel like we have leftovers for days. So on days that I am craving food from the Far East, I throw together this little number. Put chicken into slow cooker, then pour over remaining ingredients. Cover and cook: low 6-8 hours; high 4-6 hours. 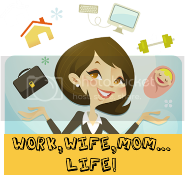 I am visiting from reading you guest post on Work, Wife, Mom..Life..I love your post.. I am now your newest follower and if you would like to check out my little blog..